Facebook has a policy against before-and-after weight loss pictures and deemed this woman’s picture inappropriate. The picture of Marilyn McKenna shows her fitting both of her legs inside one leg of a pair of her old pants. 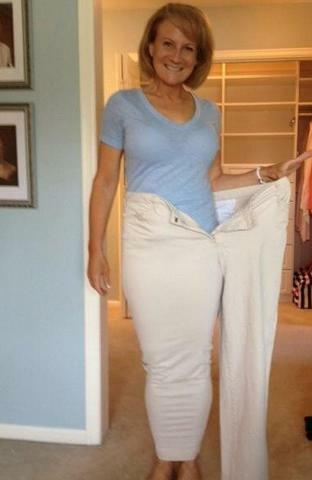 McKenna posted the photo to celebrate losing more than 100 pounds, but shortly after the picture was taken down. According to KING 5, a Facebook representative said the photo was rejected because McKenna had paid to “boost” the picture, which would help it to reach a larger audience. Because of this, Facebook considered the photo an advertisement. “Facebook’s terms require advertisers of weight loss and other adult products to limit the audience of their ads to people aged 18 and over,” the spokesperson told KING 5. Hey, Facebook! What “products” am I promoting?! You dunderheads! My website, my blogs, my videos… It’s all free!! Im not selling anything! I guess Facebook enforced this policy because of all of those weight loss scams that flood social media outlets, email, and ad networks, but doesn’t it seem fair to me. It’s ridiculous that they ban innocent, hard working people dedicated to their health and aren’t spamming. I think they should even be able to promote their weight loss products or services, as long as they are not spamming. What do you think?